I’ve been so excited to share this recipe with you. I hosted a dinner party over the holidays with some of our friends. My friend Julie brought this fruit salad and I could have eaten the entire bowl. I’m sure it has nothing to do with the fact that the dressing is sweetened condensed milk :). Yes, sweetened condensed milk. Possibly the best and my new favorite salad dressing. I can’t believe I’ve never thought to use it over fruit. I love this because you can use canned fruit, fresh fruit or a combination of both, which makes this so easy to make all year round. I’ve made this several times over the last few weeks and we haven’t gotten tired of it. We have loved every single bite of it. This fruit salad is divine. I am so in love with it. 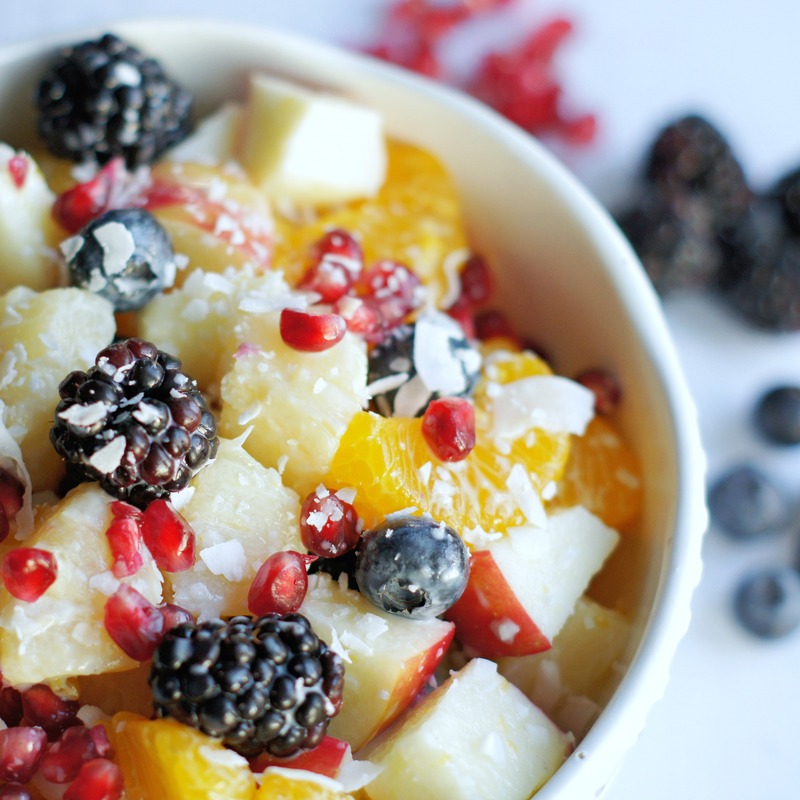 The sweetened condensed milk is what takes this fruit salad to the next level. This is definitely a recipe you need to add to your “must make list.” This is so simple and so delicious. 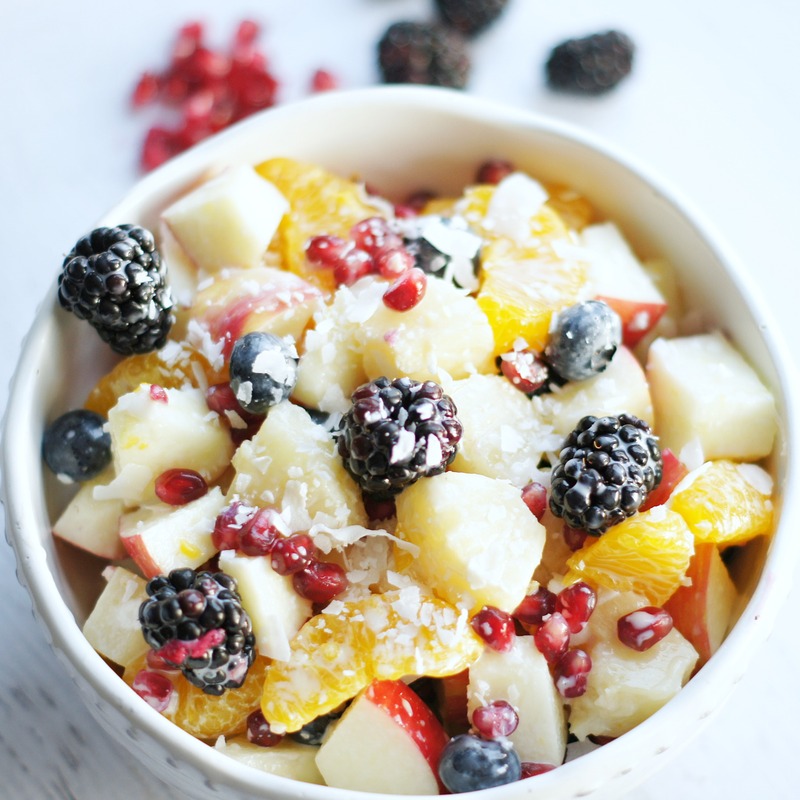 Fruit drizzled with sweetened condensed milk and sprinkled with a little coconut . . .this is the perfect fruit salad for any time of the year. Combine fruit in a bowl, drizzle with sweetened condensed milk and gently stir until fruit is evenly coated. 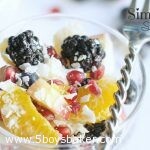 This fruit salad is so versatile, I've just listed the fruits I used. You don't even have to use the amounts I listed. If you want more apple, throw in another one. Don't like blueberries? Leave them out. Are you catching my drift? This is one of those recipes that really isn't a recipe. Add anything you want - grapes, strawberries, peaches, raspberries, cantaloupe, etc. Just adjust the amount of sweetened condensed milk according to how much fruit you use. You just want the fruit lightly coated, you don't want it swimming in it (although I'd probably be okay with that, I'd just slurp it up). Yum! I’m going to make this tomorrow!